An artist's conception of the Spiderweb Galaxy, which is actually a massive collection of growing galaxies in the early universe. Protogalaxies are shown in white and pink, while the blue indicates the location of the carbon monoxide gas surrounding them. Like a spider devouring prey from its web, a mature young galaxy is devouring the recycled gas that surrounds it, rather than snacking on its neighbors. "This is different from what we see in the nearby universe, where galaxies in clusters grow by cannibalizing other galaxies," lead study author Bjorn Emonts, a researcher at Spain's Center for Astrobiology, said in a statement from the National Radio Astronomy Observatory (NRAO). "In this cluster, a giant galaxy is growing by feeding on the soup of cold gas in which it is submerged." The most massive galaxies in the universe form through a combination of rapid star formation and the cannibalization of other, smaller galaxies, but how much each process contributes in the building of super-galaxies has been an ongoing question. "Extremely massive galaxies are seen in the young universe, but their presence is puzzling because we do not yet understand how they became so massive so quickly," said Nina Hatch, an astronomer at the University of Nottingham in the United Kingdom. The research was published in the journal Science. Hatch, who was not involved in the study, authored an accompanying Perspectives article about the new research paper. "How do they get enough fuel to form stars so rapidly?" In search of an answer, Emonts and his team turned to the Spiderweb Galaxy cluster, located 10 billion light-years from the sun. Because of the time it takes for light to travel across space, they are seeing the cluster as it was when the universe was less than 4 billion years of its 13.7-billion-year age. Like a giant spider web, the collection hosts a relatively mature galaxy at its center, surrounded by a web of diffuse ultraviolet light in which tens of smaller, fly-like galaxies are caught. Despite its young age, the central galaxy is one of the most massive galaxies in in the young universe, according to Hatch. In hopes of finding the gas that fuels the growth of galaxies in the Spiderweb, the researchers studied the gas around it, which serves as the building blocks for stars and galaxies. 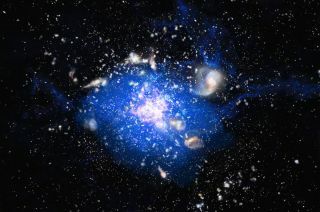 They found a cloud of gas roughly 100 billion times the mass of the sun that engulfed the growing galaxies. Previous work revealed that billions of young stars had lit up the Spiderweb, leading the researchers to conclude that the super-galaxy is growing directly from the cloud. "This is a huge system, with this molecular gas [cloud] spanning three times the size of our own giant Milky Way," said co-author Preshanth Jagannathan, of the NRAO, in a statement from Spain's Center for Astrobiology. "It appears that this whole system eventually will collapse into a single, gigantic galaxy," Jagannathan said. In addition to its size, the cloud of gas is surprisingly cold. "It's shocking how cold this gas must be — about minus 200 degrees Celsius (minus 350 degrees Fahrenheit)," study co-author Matthew Lehnert, a professor at the Institute d’Astrophysique de Paris, said in the same statement. "We expect a fiery process — lots of galaxies falling in and heating gas up. Therefore, we expected that all the cold gas would be locked up deep within the galaxies." Instead, the cold cloud surrounded the protogalaxies, feeding their evolution. Its composition is also surprising. Observations revealed a large quantity of carbon monoxide, material forged in the heart of stars and released in their explosive deaths. Only a third of that material is locked up inside the galaxies, while the rest lies between them. Rather than consuming pristine gas, the Spiderweb Galaxy is relying on recycled material to fuel its growth. Still, its exact source remains a mystery. "The carbon monoxide that we detected is a byproduct of previous stars, a form of cosmic recycling, but we cannot say for sure where the gas came from or how it accumulated in the cluster core," Emonts said. "To find out, we'd have to look even deeper into the universe's history." Follow Nola Taylor Redd on Twitter @NolaTReddFacebook or Google+. Follow us at @Spacedotcom, Facebook or Google+. Originally published on Space.com.